Researchers from the U.S., U.K., and Germany sequenced the genome of the strain of wheat used to make bread, an achievement that is expected to increase yields and enhance the nutritional value of this crop. The findings of the consortium, comprising researchers from 10 different institutions, appear today online in the journal Nature. U.S. Department of Agriculture, one of the funders of and participants in the research, says wheat is considered one of the world’s critical staple foods and grown on more land area than any other commercial crop. Bread wheat, Triticum aestivum, accounts for some 20 percent of all calories consumed by humans. The research adapted a genomic analytical process called shotgun sequencing that enables the sequencing of DNA in parallel rather than serially, breaking up the genome into smaller, more workable segments for analysis and then reassembling the pieces. Cold Spring Harbor Laboratory in New York, one of the participants in the study, says analyzing the bread wheat genome requires this large-scale approach, since it has some 17 billion base-pairs of DNA, about five times the amount of DNA as in the human genome. The bread wheat genome is called a hexaploid genome, says Cold Spring Harbor Lab, which means that it has six copies of each of its seven chromosomes, or the complete set numbering 42 chromosomes. In contrast, the human genome is diploid, with 23 pairs of chromosomes and a total of 46 chromosomes. Sequencing data for this type of wheat were then compared to known sequences for rice and barley grains, as well as other grasses. The results yielded from 94,000 to 96,000 genes. The study shows the evolution of bread wheat from ancestral strains to its current domesticated form. 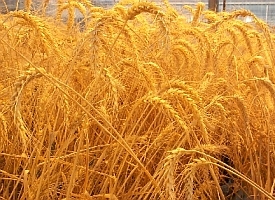 The research indicates that the bread wheat genome has made significant changes, including loss of gene family members during the time it was being domesticated. It was during this period of some 8,000 years, say the researchers, that bread wheat expanded their number of chromosomes from two to eventually six. The larger number of chromosomes is considered a desirable trait to overcome the sterility that occurs when breeding hybrid crops. A team at University of California in Davis working with the USDA scientists, sequenced the genome of the parent species to bread wheat, Aegilops tauschii. Comparison of the current to the parent varieties made it possible to assess genomic changes that have taken place in bread wheat since its origin 8,000 years ago. The research uncovered expanded gene families within the bread wheat genome. Most of these gene families are associated with crop productivity and include those involved in defense, nutritional content, metabolism, and growth. The results are expected to help breeders develop hardier varieties by linking genes to key traits, such as disease resistance and drought tolerance. The research was led by investigators from University of Liverpool’s Centre for Genomic Research and funded by U.K.’s Biological and Biotechnological Sciences Research Council, Royal Society, German Ministry of Education and Research, National Science Foundation, and USDA’s National Institute of Food and Agriculture. You left out the University of Bristol who were a major partner in the project. Just how has legislation affected general public health in relation to as well as nutrition problems?